Some present cities, towns, and villages in this country make much of the fact of having been included in William the First’s surveys of England in 1086 and 1087 when he wanted to know the extent and taxable value of the land. There are two volumes of the results, the Great Domesday and, of course, the Little Domesday. The first of these covered all of the country except for Essex, Norfolk and Suffolk, and for some reason London and Winchester were completely left out. As they were the two main cities of the land, perhaps there were already records of their value. The three Counties omitted were put in the second volumes. Perhaps the inhabitants were more resistant and obtuse when they learned the reason for the visitations? Whilst Hepworth is certainly included in the Domesday Book, as it is known, we can claim to having a much older settlement in this small valley, which is not much more than a dip in the ground but I suspect that a stream ran along it and the surrounding woods would have provided the meat and veg. Certainly the Romans found it to their liking as much of their pottery has been found here in recent times by Audrey McLaughlin, Bernard Rumbelow and Neville Clarke. Archaeological evidence is very important but photography has added a new dimension to historical study. Here are two ‘photos of The Street, the first taken in 1908 and the second around 1920. 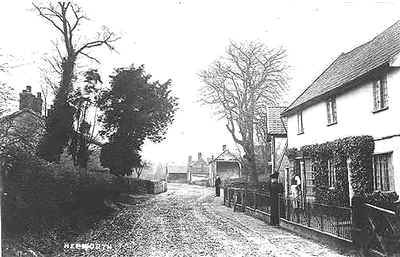 The photographer(s) stood outside what is now ‘Willowdown’ house and the views are the same, looking north. In the picture above is a single building that was a shop and dwelling in the same ownership. In the late 19th C this was kept by Ellis Anness and her daughter Clara Bean, but in 1904 Walter Hinnells took it over until 1912 when Hannah Hinnells became the shopkeeper. The 1908 ‘photo probably shows both of the Hinnells, he properly aproned and ready for business in what would have been part butchers, drapers, grocers and anything else the villagers needed. The lady on the other hand, most likely warned by the photographer of his intention, has put on her best outfit and elegantly wears the latest fashion in the style of Queen Alexandra. She has placed herself close to the photographer to show off her dress and wonderful hat. What a shame it isn’t a colour ‘photo as the outfit could have been blue or whatever colour you choose. The old gentleman standing under the chestnut tree in the 1908 photograph is George Hills, the owner of Chestnut House as it was called then, now Chestnut Cottage, owned by David Stannard. George Hills was born in Market Weston in 1845 and died in 1927. Apprenticed as a tailor to a Mr Woodward in Hepworth in 1855, he later joined the Met. Police Force in 1865 but after 3 years he resigned because of a conscientious objection to working on Sundays. In 1867 he married Julia Stevens of Walsham le Willows, and had a grocers business in London. Later he worked for the City of London Police for 25 years as a tailor. On retirement he came back to Hepworth. He was a devout Methodist and attended their meetings which were held in what is now a workroom/shed/garage in David Stannard’s Chestnut Cottage, and a room in Greyhound Lane, Hopton, before the Primitive Methodist Chapel, now Church House was built in 1861. 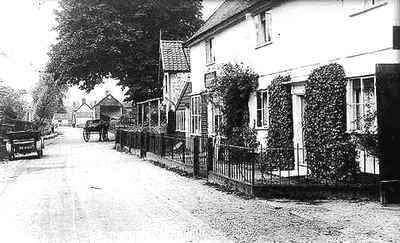 The second building on the right is, I believe, what was then known as Chestnut Cottage, a small, one up one down, house, which stood just to the right of the chestnut tree, now a grassed area fronting The Street in the grounds of Chestnut Cottage. The Chestnut tree was planted by Thomas Stevens in 1812 to mark the birth of his son Thomas. In both ‘photos you can see high up on the end wall of the building third from the right what appears to be a clock, but which was in fact a weather vane mounted on the roof with a gearing mechanism that operated an arrowed dial indicating the wind direction, which is what you see on the wall. The next building is what is now Stone Cottages and the end of that building, which was then three cottages, shows that adjacent to the ‘Half Moon’ P.H. was an outbuilding half the height of the cottages attached to the end cottage. Today you can see that it has been extended upwards to form part of No 2. Stone Cottages – look at the different brick work. Beyond Stone Cottages in the ‘photos there is no extension shown to Stores Cottage. The 1908 picture shows a large barn type structure which has been replaced in the later ‘photo by what I think is the building used until fairly recently by Thomas Christie as his butcher’s shop. The indistinct buildings on the left half hidden by the trees are those which were written about by my wife Irene in the October issue of the Newsletter. The later ‘photo shows a large lamp seemingly erected on a post in the front grounds of the Primitive Methodist Chapel, but I know that in fact the lamp was held between two posts from other evidence I have. Where is the lamp, please? The road surface in the first ‘photo is not made up and Bill Goodson has told me that this didn’t happen until the 1920’s when Bill, as a child, remembers walking to Hepworth School and going up and down over the many piles of granite chippings left on the roadside to make up the road surface which may have occurred by the time the second ‘photo was taken. On the road you see the form of transport that was to give way to the other. The motor car, index FX 4142 appears to have a cloth roof which has been let down, and a ‘bull’s eye’ lantern for a rear light. This car was a 10h.p. Singer 2 seater open tourer, coloured fawn. It was first bought by the Secretary of State for War on the 8th July, 1919. On the 21st January 1920 it was sold to Holden Davis of Cavendish Square, London W.1. who only kept it until 2nd September of that year when he sold it to Mrs Mary Constance Ella Barratt of 32 Norwich Street, East Dereham, Norfolk. Mr Davis had what was then a fairly common first name for an East Anglian so he may have had a family connection with Mrs Barratt who used the car for ‘trade’. One final observation – the later photo of the shop shows on its end wall an oblong tin sign depicting the ‘Union Jack’ with the letters BP in a centre circle. This was to indicate that the shop sold petrol. The British Petroleum Company, originally the Anglo-Persian Oil Company, was at that time the UK subsidiary of the German-owned Europaische Petroleum Union. Petrol was then usually sold from shops, sometimes from chemists shops for doctors’ use (in their cars, not their prescriptions). This was in two gallon drums. Maybe Mrs Barratt was buying petrol for her car. The year 1937 was a very eventful one for both Florrie Pask, who got married that year, and the inhabitants and first two buildings on the right of the ‘photos. On Sunday, 14th November that year, Bill Goodson was cycling back to Hepworth with his friend Jack Baker when they saw on their approach from Barningham, flames lighting up the sky in Hepworth. The shop in the ‘photos had caught fire. A Mr and Mrs G. Baldry and their two children were in bed asleep when at 10 p.m. Mr Baldry was awakened by the smell of smoke in his bedroom. He got up, looked out of the front window, and saw that the building below him was ablaze. The family attempted to escape down the staircase but the fire prevented this. Fortunately there was also a small rear staircase and they made their way out of the building. Mr Baldry went next door to Chestnut Cottage and banged on the front door to seek help. Mr Butcher, who lived there, thought the local ne’er do wells were playing a prank on him, so he didn’t answer the knocks, but eventually did. Local villagers managed to save Mr Butcher’s furniture from the fire which had also caught his house alight, but they could do nothing to save anything of Mr Baldry’s so intense was the blaze. Lost in the fire was a valuable oil painting which Mr Baldry had recently refused to sell to a dealer. Both buildings were destroyed in 20 minutes, the fire was so fierce. Also burnt down was a barn belonging to Mr Twigg, which had been situated at the rear of the shop. The Fire Brigade from Bury St Edmunds attended. They ran their hoses to a small pond almost opposite (probably in the entrance to the meadow at the back of the Primitive Methodist Chapel) but this was quickly drained, so further hoses were run down The Street to ponds at Hepworth Hall House and the meadow opposite. Neville Clarke remembers that he was awoken (he then lived in the centre cottage of Stone Cottages) by the thump, thump, thump, of the firemen’s boots. The hoses leaked and Bill Goodson saw the water freeze in the night frost. Some of the Fire Brigade didn’t leave the scene until 10am the next day. A Police Inspector from Ixworth was there with Police Constables from Barningham, Hopton and Walsham. Over the next few days Neville Clarke, with a brother and sister, searched amongst the debris of the fire and found some burnt and scorched coins, ‘tanners’, shillings, two ‘bobs’, and some copper. The money was not accepted by shopkeepers, so they got their friendly coalman, Mr Backlog, to exchange it at the bank, no doubt at a percentage. Mr Backlog used to deliver lorry loads of coal to Neville’s mother and she would sell it by the sackful to villagers from a shed where Anton Woodward’s new wooden garage is now between Stone Cottages and the Community Post Office. I wonder what became of the BP tin sign, they tell me it would be worth a good deal of money now. And I wonder if the shop still sold petrol in 1937? ‘My mother, a widow with two children, myself and older brother who was a boarder at an agricultural college in Basingstoke, came to Hepworth in 1932/1933 from Lawshall to take over the shop in Hepworth. In September 1934 she married Mr. J. Baldry who at that time farmed Red House Farm which is no longer there. It was my mother who discovered the fire which was at the back of the house so wouldn’t have been seen looking from the bedroom window in the front of the house. I have no memory of a barn at the rear of the house just a large back garden. To the side of the house was an orchard with a building on it, perhaps this was the barn referred to? I wonder why the Fire Brigade didn’t use the water from the well at the side of the house and if the buildings were destroyed in twenty minutes they would have all gone before the Fire Brigade arrived from Bury St. Edmunds. The blaze was probably made worse as nearly all supplies were delivered monthly and November would have included extra for Christmas baking. Butter, margarine, lard, sugar of all kinds, dried fruit, bacon, all stuff which would have burned quickly. Plus the shop stocked cartridges for the farmers guns as well as chicken and pig food. As far as I can remember we never sold petrol but did have paraffin as villagers used it for lighting and cooking. Might this have been why the B.P. sign was on the house? Naturally I replied to Mrs. Coppin who strangely enough gave her address as ’36 Coppins Road, Clacton’. I reported to Mrs. Coppin that there was then no one living in the village called Rowell and that I regretted that Mrs. Baldry who had been living at No. 4 The Street had since died. I have heard nothing more from Mrs. Coppin. There was a church here at the time of the Domesday Survey in 1086. The present structure dates mainly from the 14th and 15th centuries. The chief material from which the church is built is flint. Cut stone dressings are used for the buttresses, arches and windows. 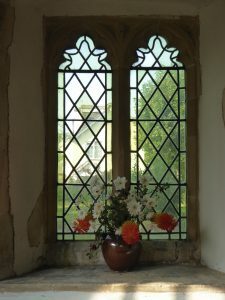 The Nave windows are in the Perpendicular style, and the Chancel windows are in the Decorated style. When the old thatched roof burned down in 1898, the new oak double hammer beam roof was installed, with its richly carved pendants, in the characteristic mediaeval Suffolk style. Among the fittings which escaped the fire were the fine old oak door, and the late 14th century font cover. This is an octagonal pinnacled spire of oak 12’6″ high, elaborately decorated with tabernacle work of arches and tracery. There is a attractive stained glass window in the chancel showing the angel announcing the Resurrection of Christ to Mary Magdalene and the other Mary. The shell emblem of the Methold family, who lived at Hepworth House, can be seen in the cloak and halo of one of the women. The same device appears on a shield in the little window on the south side. There are five bells. The Tenor bell is the oldest, dating from about 1470. 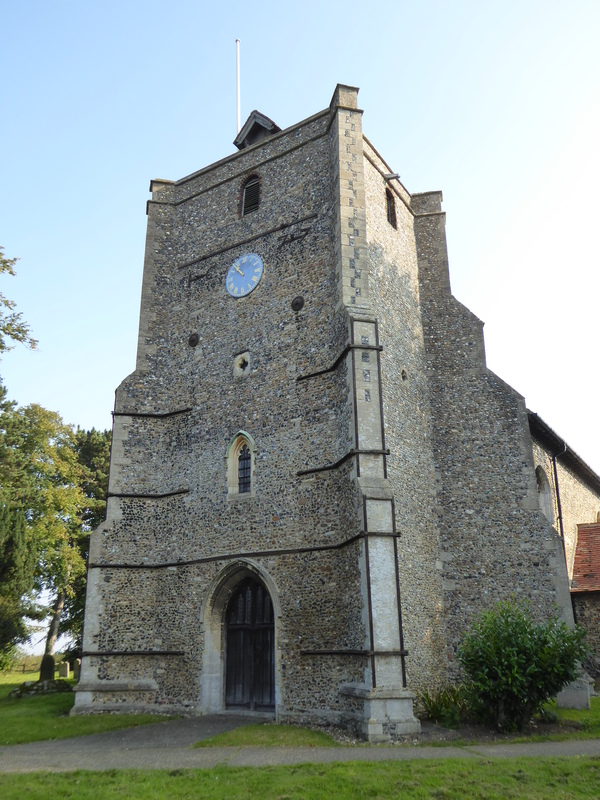 The church’s Registers date from 1688, and are now kept at the Suffolk Record Office. The Patron has been Kings College Cambridge since 1790. The list of past Rectors of the Parish goes back to just after the Norman Conquest. If you would like to read more about the church, there is a beautifully detailed account of a visit to it at the wonderful Suffolk Churches website, and you can find the page for St. Peter’s here.